John Salzer has spent most of his career in secondary, higher, and continuing education, with 4 years as a coach at Reed-Custer High School, 5 years as Registrar and Assistant Dean of Academic Affairs at the original Kendall College, 8 years as a Registrar and Instructor for an organization providing professional development for K-12 teachers and administrators, a year coordinating community education opportunities in Pontiac, and currently works at Eureka College in Eureka, Illinois. John earned his Bachelor of Arts Degree and Illinois Teacher Licensure (6-12 Math and Social Sciences) at College of St. Francis, his M.A.T. in Mathematics at the University of Idaho, and his Doctorate in Ethical Leadership at Olivet Nazarene University. 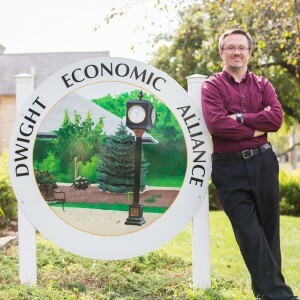 John joined the Dwight community in 2014 as an employee of the DEA and has served as a volunteer ever since, eventually joining the board in 2018. John also sits on the Executive Board for Dwight Harvest Days.